Restore the Mississippi River Delta and ESSA Technologies, Ltd. recently hosted a workshop for state and federal agencies and others working on the Environmental Impact Statement and adaptive management program for the Mid-Barataria Sediment Diversion. Experts with decades of experience developing adaptive management plans for large-scale water resource infrastructure projects presented insights and lessons learned from projects around North America, including the California Bay-Delta, Missouri River, Platte River and Okanagan River in Canada. Adaptive management is not a new concept, but professionals are increasingly incorporating it into resource management plans in major watersheds and river basins throughout North America. The lessons learned in these areas about managing large-scale water infrastructure projects in changing ecosystems, while taking into account the needs of communities and industries, will provide insight for those developing the adaptive management plans for Louisiana’s large-scale coastal restoration projects, such as the Mid-Barataria Sediment Diversion. Adaptive management is an iterative decision-making process in which a system is managed variably over time based on determined goals and objectives, with the flexibility to adjust operations due to environment and resource conditions. In the face of economic, environmental and climatic uncertainties, adaptive management can improve the effectiveness of management strategies by using rigorous monitoring and evaluation methods in a continual learning process. A primary goal of coastal restoration is to build and sustain as much land as possible, but there are key uncertainties regarding salinity changes, water levels, and changes to fish and wildlife populations. These uncertainties will need to be monitored and adapted to over time to ensure changing conditions are taken into account and adjusted for accordingly through management actions – minimizing negative impacts while maximizing land building and other management objectives. While workshop experts discussed adaptive management plans that spanned varied geographies, ecosystems, water resource needs and regulations, some common components stood out. Craig Fischenich, Research Civil Engineer with the U.S. Army Corps of Engineers, described how experts behind the Missouri River Recovery Program spent years bringing stakeholders, agencies, scientists and engineers to the negotiating table to agree on a collaborative structure to govern decision-making in the adaptive management plan. Taking the time to negotiate these details is a major upfront investment in resources, but this step proved critical for making adaptive management work on a large scale, especially with a variety of interest groups. All the experts agreed that the collaborative governance of the adaptive management plan should be put in place before anything else, including scientific research planning. Brian Symonds, former Director of Water Stewardship for the Canadian province of British Columbia, highlighted the importance of bringing stakeholders and managers together to agree to common goals and objectives as a key first step in developing the adaptive management process. In the Okanagan River, managers developed a tool using current science and real-time data to run simulation modeling around those objectives then met to determine how to optimize the system for the combined objectives of the group. This exercise structured dialogue regarding multiple objectives and tradeoffs and enhanced understanding of other parties’ management objectives. In the process, multi-party engagement, trust and transparency increased, establishing a better baseline for collaboration. Making large-scale adaptive management work “is all about the people,” as Chad Smith, Headwaters Corporation principal and Deputy Executive Director for the Platte River Recovery Implementation Program stated. Finding the right people to guide development of governance and management goals and objectives sets the tone for the entire plan; the right people, including local stakeholders from the community, are needed to lead the charge and encourage progress over time. Stakeholders should be included in a process that acknowledges their needs and enables them to partake in discussions about how to create a more successful system. Leaders need authority and responsibility to ensure they have the credentials and trust of stakeholders as well as approval from leadership to carry out adaptive management plans. Peter Goodwin, previous lead scientist for the California Delta Stewardship Council’s Science Program, highlighted the involvement of an independent scientific review panel as another critical element of an adaptive management plan. Comprised of external experts who evaluate the technical and scientific merit of proposed management actions, this review ensures that science is not being done for the sake of doing science, but to inform and feed into the decision-making process. 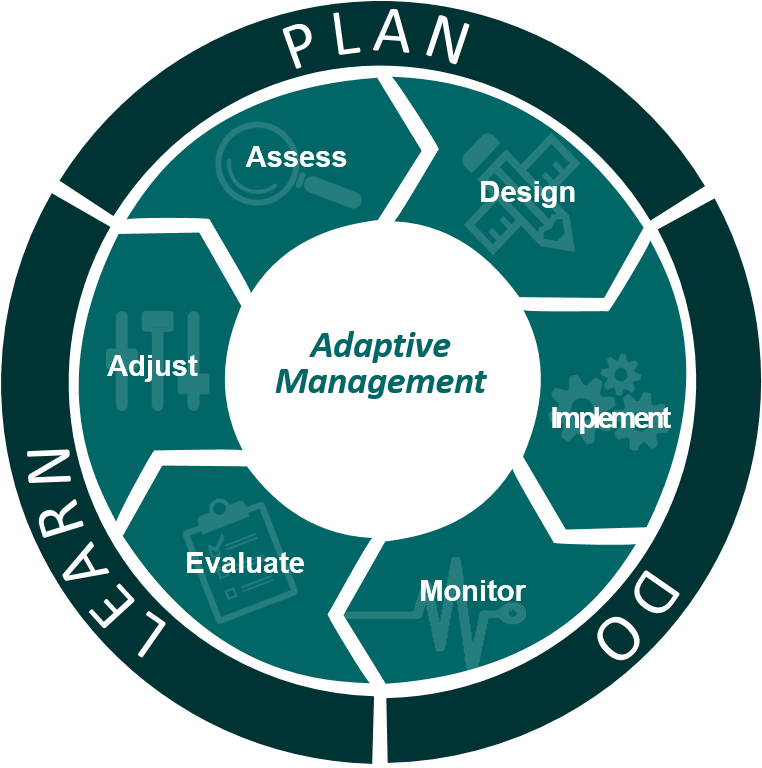 All of the experts supported independent review to help confirm that adaptive management is the right fit for the system and ensure research and monitoring data are used to advance management outcomes. In places like Louisiana that are facing ongoing land loss, subsidence and other impacts from climate change, innovative management strategies are needed. As the state implements restoration and protection projects, adaptive management will be key to increasing coastal communities’ resilience in places where living with water is the new normal.